Love the game and at 72 I can use the exercise ;) Can you suggest any similar games for regular computer use? The g-kids could use the exercise as well as school nears. 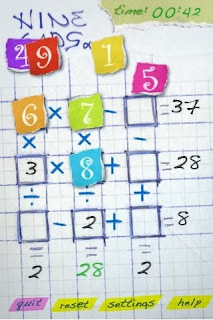 Yes, I see the potential for these types of apps supporting parents and grandparents - both in renewing their math mastery and in some cases developing it for the first time. There aren't many apps that I would endorse yet. Too many of them are simply challenging people to remember facts without giving any substantial encouragement toward building a conceptual understanding or problem solving. LEGO Mindstorms NXT - robotics to support hands-on learning - check out FIRST LEGO League too. Still, I think that these new devices (touch/iphone) have a great potential to take learning applications to places where kids have a few moments and are willing to work with their parents or grandparents - anytime-anyplace learning. Hey!! Have played this on a friend's iPhone... Any chance at all of porting it to the Droid??? Would be a mega-seller!! !